12m ago May confirms that UK will not try to 'cherry pick' in Brexit talks. Donald Tusk is expected to give his reaction to Britain’s triggering of article 50 shortly, reports Jennifer Rankin in Brussels. Sir Tim Barrow, the UK’s ambassador to the EU, delivered the letter in a short meeting this lunchtime. The letter was brought to Brussels by a British official accompanied by a security guard on the Eurostar on Tuesday. May’s statement is over. For detail, we are going to have to wait until we see the text of the letter. But the tone of her statement was quite striking; it was probably the most pro-European speech she has given as prime minister, and at times it could have sounded like the speech of a PM who was proposing joining. As Philip Hammond signalled in his Today interview this morning (see 9.41am), the government does seem to be trying to reset Brexit expectations. May says in the months ahead she will represent every person in the U K, including EU nationals. And it is her fierce determination to get the right deal for everyone. When I sit around the negotiating table in the months ahead, I will represent every person in the whole United Kingdom – young and old, rich and poor, city, town, country and all the villages and hamlets in between. And yes, those EU nationals who have made this country their home. It is my fierce determination to get the right deal for every single person in this country. We all want a nation that is safe and secure for our children and grandchildren. We all want to live in a truly global Britain that gets out and builds relationships with old friends and new allies around the world. And, now that the decision has been made to leave the EU, it is time to come together. May says she wants to continue to trade with the EU. In an increasingly unstable world, we must have “the closest possible security cooperation to keep our people safe”. She says she wants to deliver a smooth and orderly Brexit. Then there will be a phased process of implementation. There will be “consequences” to leaving, she says. She says it is in the interests of both the UK and the EU that there is as little disruption as possible. When protectionist instincts are on the rise, Europe has a responsibility to stand up for free trade. Failing to stand up for European values would be a costly mistake. May confirms that UK will not try to 'cherry pick' in Brexit talks. She confirms that the rights of EU nationals will be an early priority. She says she wants to not just protect the rights of workers, but build on them. She says EU leaders have said we cannot cherry pick, and stay in the single market without accepting free movement. We respect that, she says. May confirms that UK will not try to “cherry pick” in Brexit talks. May says leaving the EU means laws will be made in the UK. She says she will negotiate as one UK, taking account the interests of all regions. 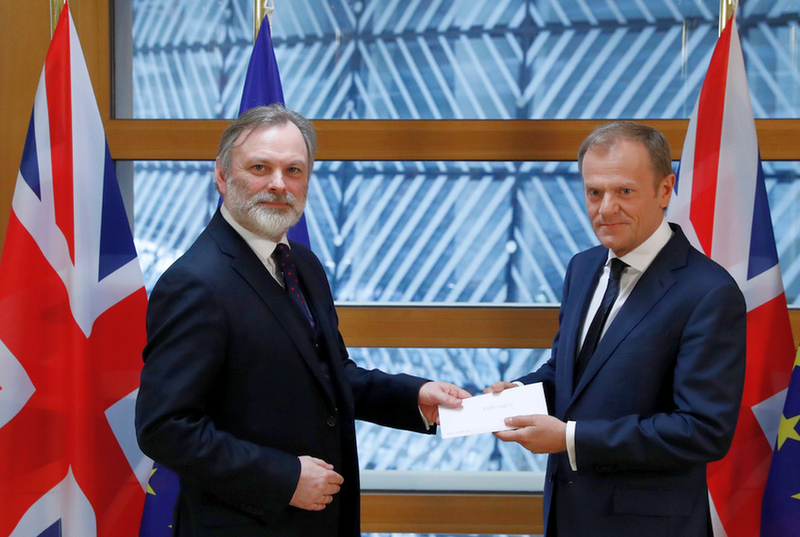 Official hand over from the UK Ambassador Tim Barrow to the EU President Donald Tusk of the UK´s intention to leave the European Union. The Brexit Art. 50 has been triggered. 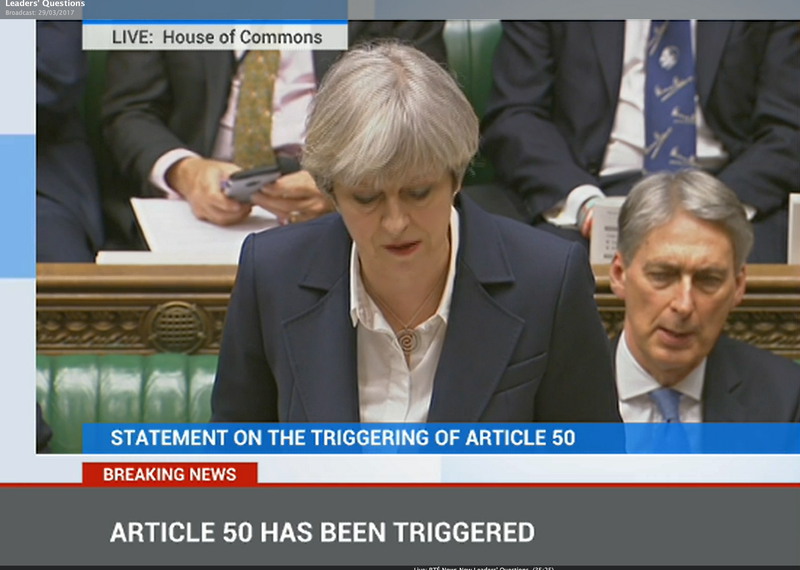 A historic moment for the UK.